At the Agritechnica, Walvoil (Italy) presents its Advanced System, a front loader control system. It contains a CANopen joystick, is Isobus-ready, and compatible to a range of machines. AT THE AGRITECHNICA TRADE FAIR from November 10 to 14 in Hanover, Walvoil will exhibit one of its control systems. The system consists of three components: the first is the SDM127/DLM127 proportional control valve, which is available with open/closed center circuits or load-sensing. The second component is the company’s CANopen-based CJW proportional joystick, which can be equipped with various grips from the Walvoil range and provides various output options for interfacing to the machine’s ECU. The last component is the CED252 electronic control unit, which performs the control functions typical of the application. It controls and monitors the control valve. The unit comes with a CAN network and provides up to eleven inputs and six proportional outputs. 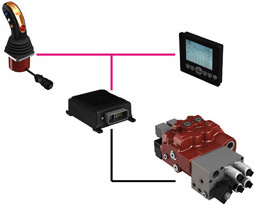 The complete system is fully Isobus compatible.